The Internet is a wonderful place if you want to start learning everything. Most of the courses you’re likely to come across are free, but for some, you’ll have to pay between fifty to two hundred dollars and more. Of course, those that are complementary rarely offer you certifications, but these matter only if you want to showcase them in your resume. Coding has become popular over the years, and part of the reason so many people want to learn how to code these days is that programmers have it good. Depending on the business they’re in, the type of programming language they master, and the country they live in, a programmer can make anything from $3,000 to $7,000 per month and even more. Concerning paychecks, interns and beginners will receive up to $2,000 per month, but this will happen for a limited amount of time. The financial matter is one thing, but the fun in coding is something else. Some languages are pretty basic, so they should take you less than a month to learn. To cut things short, I’m going to talk about some online courses that I have noticed are gathering more and more followers. The first is the MIT open courseware. Both Stanford and MIT have a limited number of courses available for free online, with the second offering several introductory classes such as Introduction to Programming in Java and Practical Programming in C.
Code Academy and Khan Academy are two other services you might want to try out. The second is free and can be used via smartphones and tablets, given that the app can be downloaded from the App Store or Google Play Store. Coursera is another learning website I myself have tried in the past and have nothing but good things to say about it. While you can enroll in some courses without paying anything, you will not get a certification. There’s also an app called Lynda and a website with the same name that you can use to study anything from software development to business, photography, and design. Unfortunately, most of the Lynda courses I checked out are rather expensive, but it’s said that they are worth the buck. If you have nothing against paying for your courses, I also suggest Udemy. Just make sure that you get one from an actual teacher or someone who has coded before. The downside to Udemy is that everyone can upload a course, so you need to make sure that the resources and the person teaching them are both reliable and capable of making you learn something. I’ve been over this with my friends time and again and they’ve always been in complete awe as to how I managed to transform my good old garage into a workshop. I didn’t put in too much effort, and this is one of the first things that I feel compelled to tell you. However, I did draft some idea and put pen to paper to organize my thoughts. You need to understand that the place will have to accommodate both your car and your tools, in a very convenient fashion. Also, you need to make sure that all the debris that comes from you having to use your DIY equipment doesn’t get in contact with your automobile. I know some of my buddies whose wives were wary of their plans, and all I can say is that you need to show them the drafts and tell them exactly how everything’s going to be. I started out by doing a bit of research and I have to point out how important this phase is. If you have little to no experience when it comes to organizing such a space, you really have to go online and look for the right information. 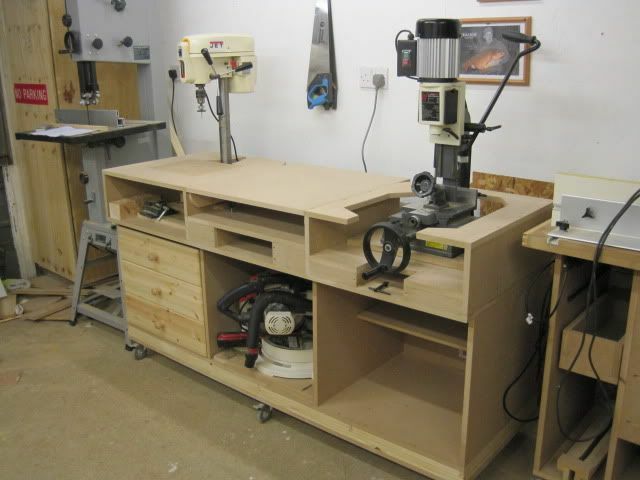 A Lifehacker article has helped me through and through because it’s where I found out that one of the measures that I had to take is designing my workbench. Of course, measuring out everything is critical when you’re trying to make the most of a space that has two purposes, one of them being to protect and store your car and the other to be the home of your newly found DIY-ing skills. Next up, you have two choices. You either set out with a budget in mind and try to adapt it as your plans start to wrap up, or you decide to splurge and buy everything instead of making any piece of equipment. The tools that you will use are probably most valuable, so you need to make sure you have a way of storing them properly. You can either go out and buy a tool chest or make one of your own. Keep in mind that such a project might be a tad too complicated for the complete beginner, and that’s because you have to focus on a lot of things. You need to ensure that the material you’re making the chest out of is corrosion-resistant so that the rust doesn’t accidentally affect your tools, as well. Don’t use extension cords, so try to adapt your outlets as best as possible. You can install them on the ceiling, on the walls of your garage, or just use extension cords but don’t leave them on the floor because you’re likely to stumble, hurt yourself, or just ruin some sort of expensive equipment. Because lighting is extremely important when performing any DIY task, you can use track lighting or just get a good-quality work lamp. Fluorescent lights are also great. Should you buy or build your own drill press stand? Recently, while I was on a break from my job, where I write about Joomla for beginners, I caught my mind wandering about a subject many workshop owners might think about themselves: Should you buy or build your own drill press stand? To give you the entire picture, I have to admit that I started entertaining this idea after an incident that happened some weeks ago when I found myself in an argument with a close friend of mine who had just bought a drill press stand and was questioning whether or not he had made the right decision. So, in case you this is a hot topic for you as well, below you can find my arguments and overall conclusions. On the one hand, I have to admit that the thought of making an investment and putting the issue to rest is quite appealing. One has to admit that, when buying an item specially designed to serve a purpose, such as the Bench Clamp Drill Press Stand, the chances are that that product is reliable and durable. Moreover, by choosing this way out, you won’t have to spend time thinking about another DIY project and trying to buy the appropriate materials. Additionally, you won’t have to waste time constructing a drill press stand and postpone working on other projects that you have dreamed about for quite a long time. Not to mention, there are plenty of people who do not know how to work with wood, the main `ingredient` of this kind of projects. On the other hand, constructing a drill press stand can turn into an adventure for the many that enjoy working with wood as part of their DIY projects. What’s more, by designing and constructing this type of equipment by yourself, you will be able to personalize the workshop and give it an original look. Because you are the one that is going to use the device and the machine, you are best equipped to decide the dimensions and the shape of the drill press stand. As a result, if you end up constructing it, you will have the call when it comes to designing an item that is both practical and that fits well with the overall arrangement of the workshop. So, if for example, you find yourself in need of extra space for your other tools, you can add a few extra drawers to the stand. All in all, I believe that the answer to the question `should you buy or build your own drill press stand?` can only be answered individually. Because, while there are people that know how to and like to work with wood, there are also others that should stick to their other projects and leave constructing drill press stands to the pros. I, for one, belong to the latter category! If you want to learn a thing or to about programming and it’s basics, I recommend watching the following video. 2019 Joomla Programming tips • Proudly powered by WordPress and Goedemorgen.